Pita Foliake Hopoate was one of of the longest served, if not the longest served, Area Seventies of [The Church of Jesus Christ of Latter-day Saints]. 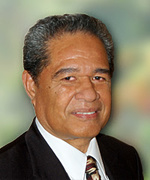 Elder Hopoate is a native of Tonga, where he served as bishop, stake president, mission president, regional representative and Missionary Training Center president prior to his call as an Area Seventy. He was a farmer but also worked as an Church Educational System supervisor. Elder Hopoate was the Church Educational System country supervisor for Guam, the Mariana Islands, the Federated States of Micronesia and neighborting countries. As an Area Authority Seventy, he served in the Asia North Area, which consists of the various islands of Micronesia as well as Japan and Korea. Elder Hopoate is a graduate of Brigham Young University Hawaii and was recognized as a distinguished alumni in 2008. In April 2009 Elder Hopoate was honorably released as an Area Seventy; he had been serving since the first Area Seventies were called in 1995. This page was last edited on 24 November 2017, at 21:33.